When you first open The Delitzsch Hebrew Gospels, you will be delighted to find a unique version of the Gospels with many features. Great care has been taken to present the masterful work of Franz Delitzsch, together with a new English translation, in a manner that brings honor to Messiah's name, and encourage faithfulness in his followers. The Delitzsch Hebrew Gospels (DHE) is perhaps the best entry point to seeing, learning, and understanding the Gospels from a Jewish matrix. An intuitive design, a beautiful translation, eloquent and informative introductions, extensive glossaries, and insightful features make this edition of the Gospels truly unique. The DHE has been conceptualized and designed to give students of the Gospels an opportunity to study the words and teachings of Yeshua of Netzeret in their historical context. Each section of the DHE is important and requires familiarization and study. This is a brief overview of the sections that comprise the DHE. 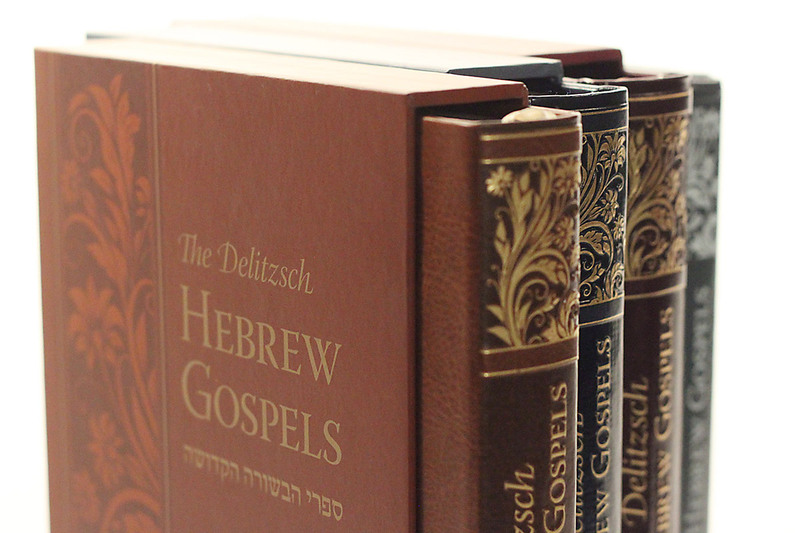 The Delitzsch Hebrew Gospels comes in different editions, all sharing the same intuitive design, translation, and informative introductions, glossaries, maps and charts. Explore more in-depth information below. In 1873 the British and Foreign Bible Society commissioned Franz Delitzsch to prepare a translation of the New Testament into Hebrew. Delitzsch agreed and set to work utilizing his extensive knowledge of mishnaic Hebrew and first century Judaism to create a translation and reconstruction of the Greek text back into an original Hebrew voice. His reconstructing translation was completed in 1877. After the first edition, it went through extensive review and revision for the next 13 years. The final edition was published in 1890 under the care and supervision of Gustav Dalman. Sixty thousand copies were distributed for free throughout Europe resulting in tens of thousands of Jewish people coming to know Yeshua as the Messiah of Israel. Those Jewish believers and their influences are the very embers that have ignited this modern day hope and revival. Since that time the Delitzsch NT has continued its good work through a series of reprints by various missions to the Jews. It is our honor to work alongside this great man of God and bring all of his wisdom, scholarship and vision to today’s people of God in a fresh and relevant way. We pray that it will allow even more Jewish people to engage in the life giving words of Yeshua. 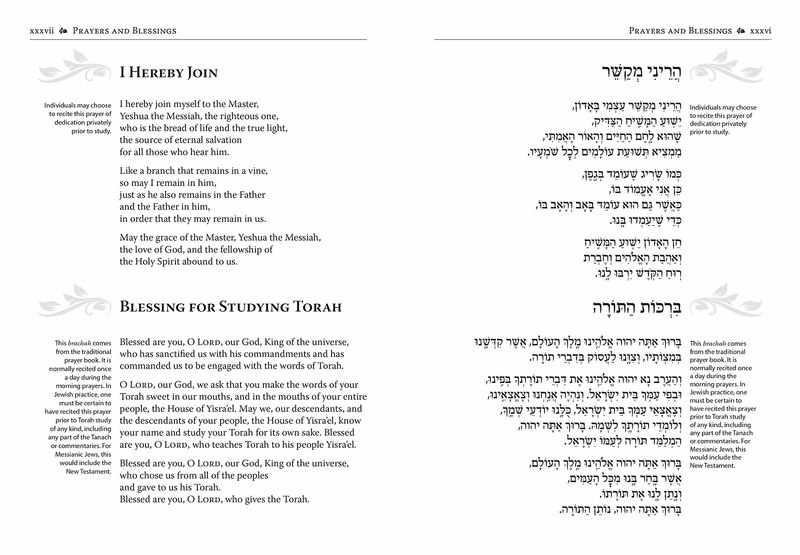 To this end, Vine of David has created the Levy Hirsch Memorial Edition. 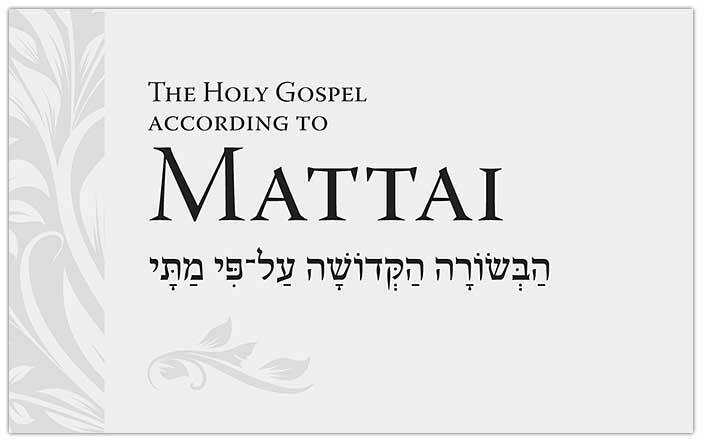 Through this edition the life giving words of the Messiah of Israel will be distributed for free into the hands of Jewish people that inquire of the Gospels. 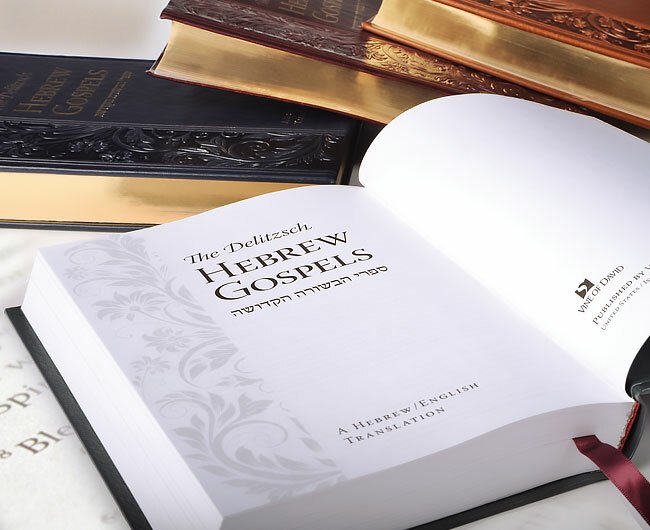 By your purchase of The Delitzsch Hebrew Gospels, we are able to make this beautiful volume available as a testament for the Messiah to his people. In clear persuasion Franz Delitzsch believed that "Only God’s Word does it". Only the Word of God can stir a heart and draw it to the Father. We pray that as you devote yourself to the study of the Holy Gospels that your hearts will be filled with faith and understanding, and that you will be moved to reflect the Messiah more than ever. We pray that the joy of your salvation will be renewed as you encounter the Gospels in a fresh manner through the faithful devotion and work of Franz Delitzsch. 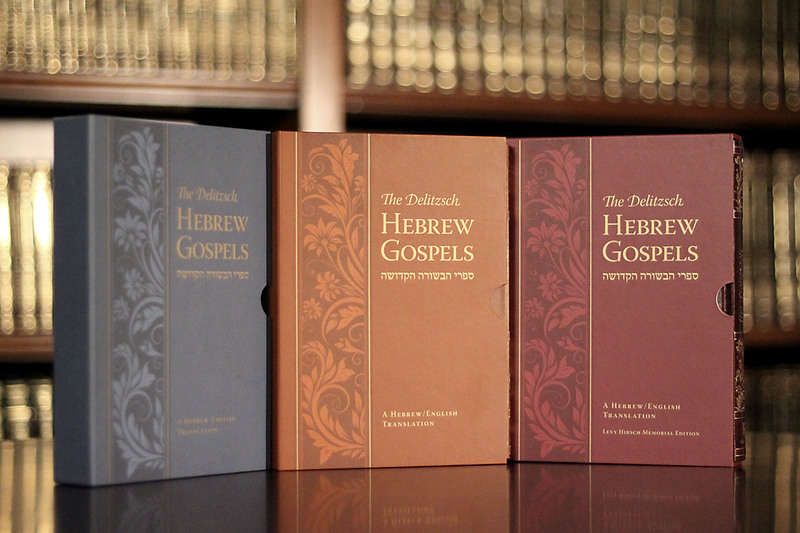 When you first open The Delitzsch Hebrew Gospels, you will be delighted in what you see. You will find a unique version of the Gospels with many features. 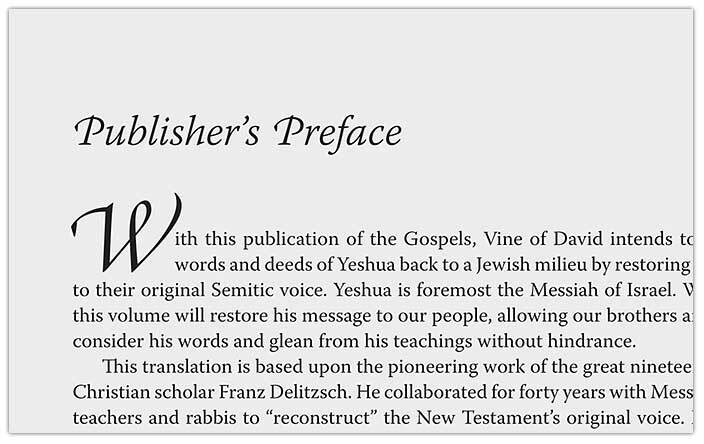 Vine of David has taken great care to present the masterful work of Franz Delitzsch together with a new English translation in a manner that will bring honor to the name of Messiah, and encourage faithfulness to his followers. Publisher’s Preface: Expresses the vision of this work, gives due honor to Delitzsch, and establishes the Gospels as Jewish literature. Translator’s Preface: Shares our approach to the translation, provides some history of the original Delitzsch work, affirms the Greek manuscripts as the original source text, and discusses some of the strengths and weaknesses of the translation. 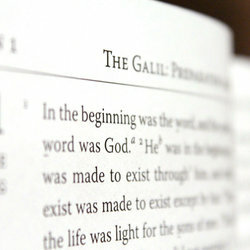 An Introduction to the Gospels: A compelling introduction that firmly places Yeshua back into a Jewish framework. The introduction opens with the following pacesetter: "The Gospels are Jewish. We owe a debt of gratitude to those who preserved them and transmitted them through the centuries, but the time has come for us to reclaim what is ours. The Gospels belong to the Jewish people, as does the central character in the gospel story." Prayers and Blessings: The DHE is not designed for casual reading. 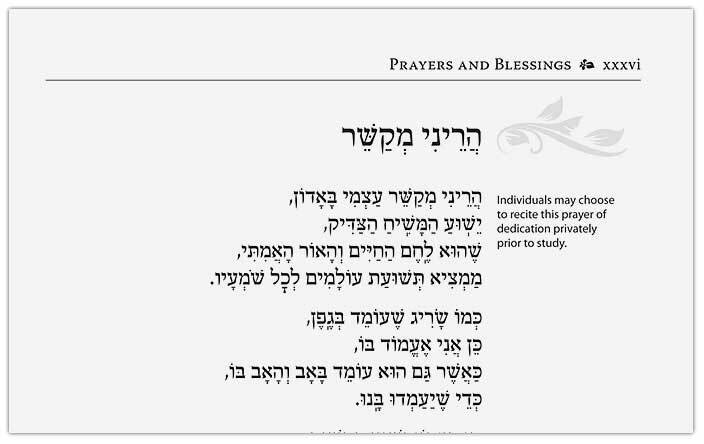 The Prayers and Blessings section is composed of traditional and non-traditional prayers that will express thanks and prepare one’s heart for the study of the Holy Gospels. 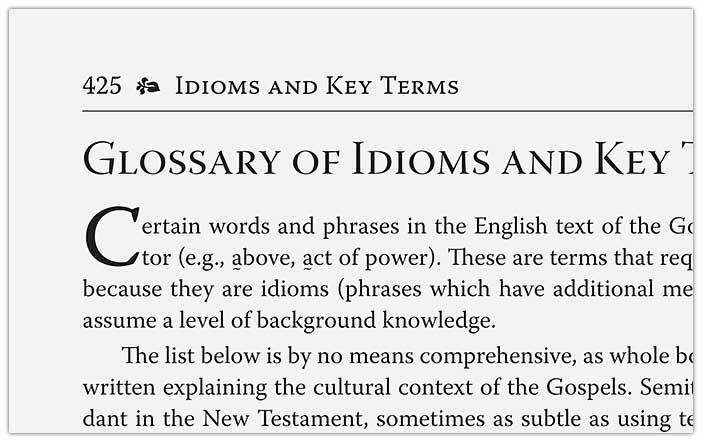 Glossary of Idioms and Key Terms: Certain words and phrases in the English text of the Gospels are marked with an indicator. These are terms that require additional explanation, either because they are idioms (phrases that have additional meaning beyond their face value) or they assume a level of background knowledge. This glossary contains over 250 entries giving greater meaning and context to Hebrew idiomatic words and phrases found in the Gospels. 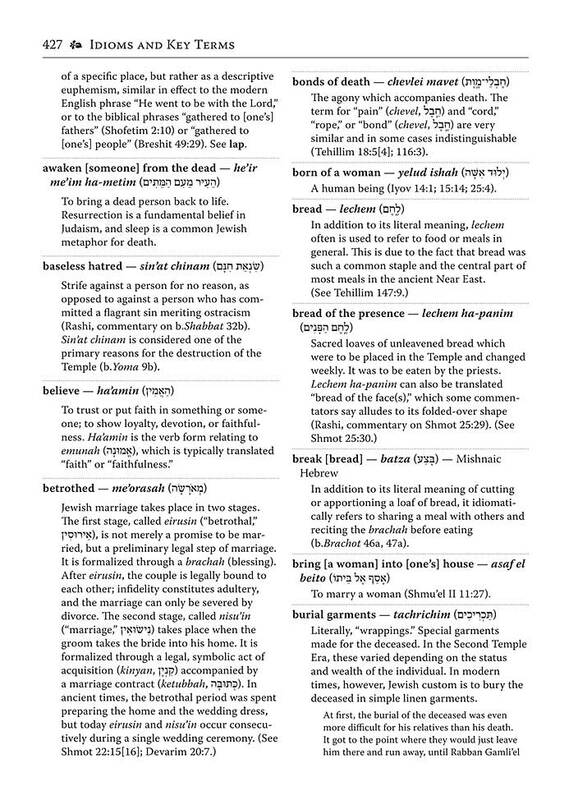 Glossary of Transliterated Hebrew Terms: Words can communicate many different things depending on the context. Some words and concepts cannot be properly translated from the source languages of Greek, Aramaic, and Hebrew into English. 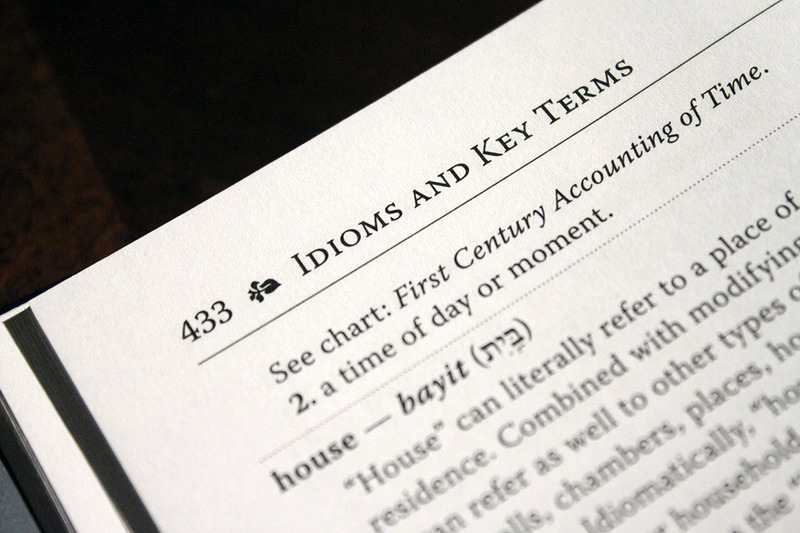 This extensive glossary gives the broader meaning of the original language and context of important words. 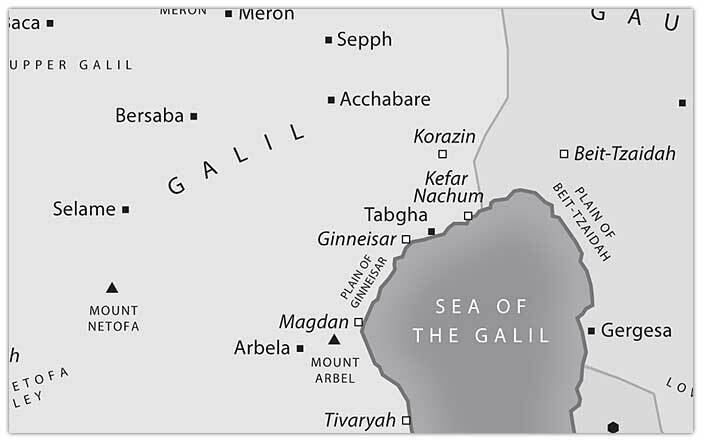 Glossary of Proper Names: Names of people and places are transliterated from Hebrew. Anglicized versions and a pronunciation guide for these names can be found in the Glossary of Proper Names. This approach intends to bring the reader closer to the world and people of the Gospels, reminding the reader that the Gospels are Jewish literature written by Jews. Additional Sections: In addition to the various glossaries, the DHE has several supplementary guides to elaborate on concepts found in the Gospels. These provide references about times, weights, and measurements as well as Gospel indices and maps. 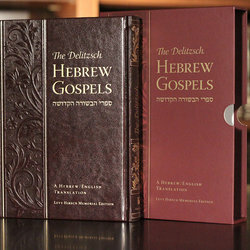 The Delitzsch Hebrew Gospels comes in four unique editions, all sharing the same intuitive design, translation, and informative introductions, glossaries, maps and charts. 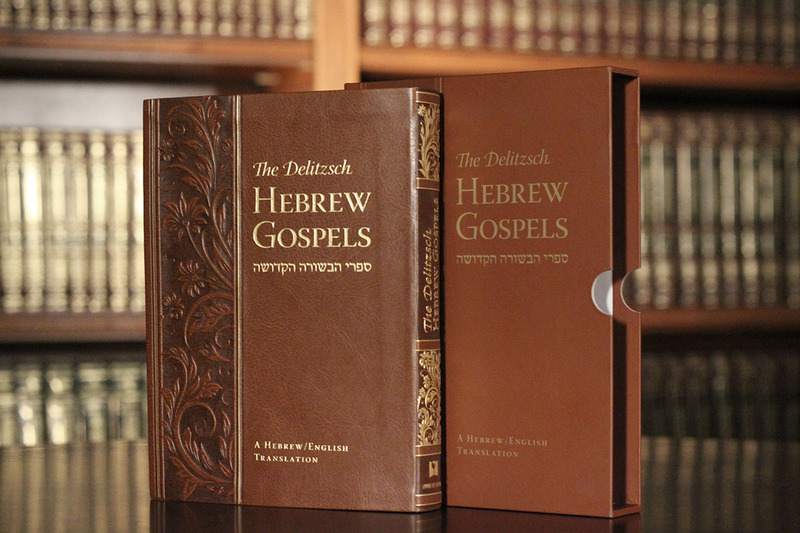 Feel free inquire about this special edition that is distributed free into the hands of Jewish people who are interested in the Gospels. This edition is available through pre-approved channels. Binding: Smyth sewn (lay flat), round back, headbands, gold gilding, and two placement ribbons. Cover: DuraTone™ PU/EF Synth Leather. Decorative heat burnishing, Foil stamped (Brushed Gold), squared corners. Packaged: Inserted into a ridged protective slipcase, Shrink-wrapped, 12 per carton. Thickness 1.5", Weight 2.6 lbs. Cover: DuraTone™ PU/EF (Deep Navy Blue) Vintage. Cover: DuraTone™ PU/EF (Rich Brown) Vintage. 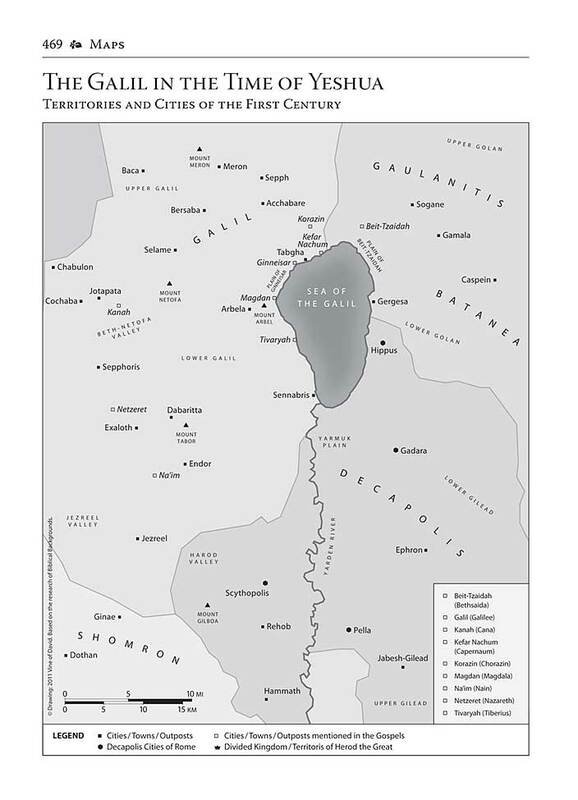 The DHE has been extensively reviewed by various Messianic and Christian leaders. The writer of Koholet (Ecclesiastes) reminds us "Of making many books there is no end, and much study is a weariness of the flesh" (Ecc. 12:12, ESV ). Not all books are helpful or necessary. But occasionally, a book comes along that needed to be written, one for whom many will have occasion to rejoice. 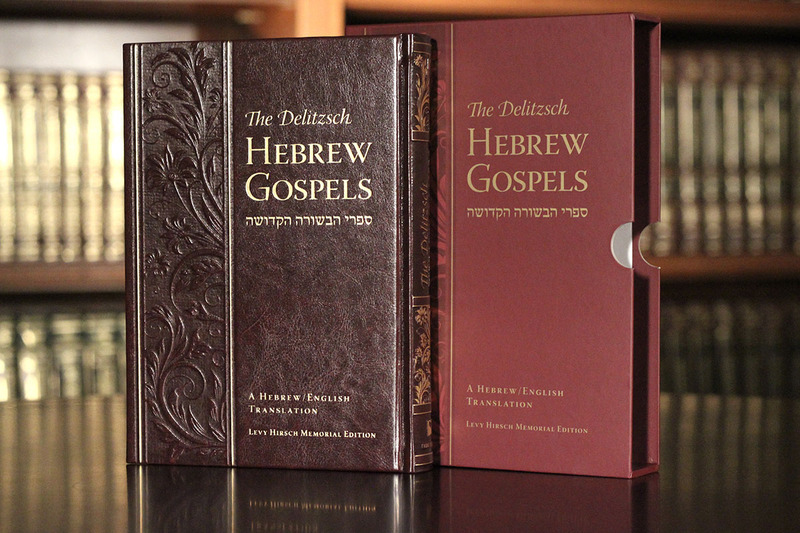 The Delitzsch Hebrew Gospels: A Hebrew/English Translation (Vine of David, 2011), hereafter DHE, is one of those necessary books, something that needed to be done, and something that has been done very well indeed. Four words summarize my commendation of this book: its excellence, its scholarship, its beauty, and its usefulness. 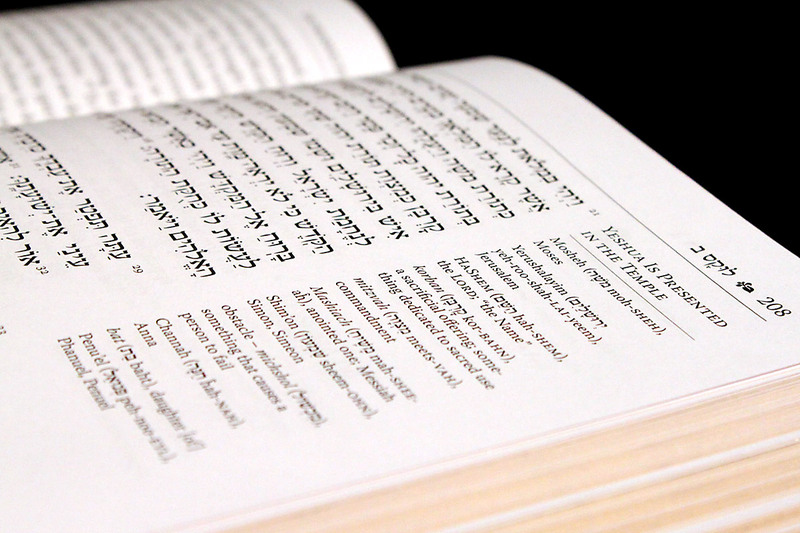 The Excellence of the DHE - The DHE exhibits excellence because of the Delitzsch Hebrew translation itself. A month before I received a copy of this text for review, I discussed the Delitzsch translation with one of its champions, who for fifty years has published and distributed Hebrew translations of Hebrew-Christian literature in Israel. He reported a conversation he had with David Flusser, who at that time was Professor of Early Christianity and Judaism of the Second Temple Period at the Hebrew University of Jerusalem. When Flusser heard that another translation of the New Testament into Hebrew was being done, besides that previously done by Delitzsch, he reacted with outrage and disdain, considering any new translation into Hebrew to be redundant and foolish. He proclaimed his confidence that not only was the Delitzsch translation the best translation imaginable into Hebrew, but also, in his view, the best translation ever done of the New Testament into any language. While one may suspect Flusser of hyperbole here, one must not dismiss his verdict on the quality of the translation. Flusser was an Orthodox Jew, and a world class expert in his field. For him the Delitzsch translation was literally without parallel. Of this we should take note even if we might beg to differ. 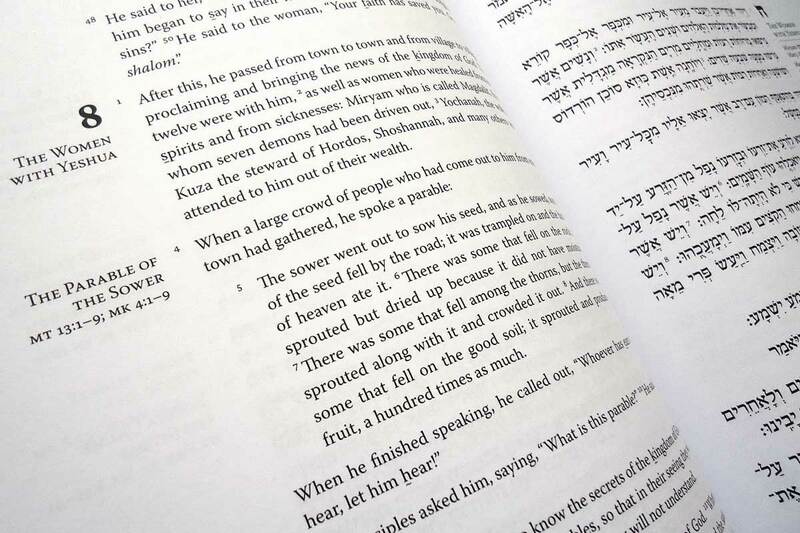 Vine of David takes the unusual step of translating Delitzsch's Hebrew translation into English, making the English version a translation of a translation, one that appears to be done consistently and with due diligence. They argue that this process affords us an opportunity to appreciate the Jewish nuances Delitzsch detected in the Greek New Testament. 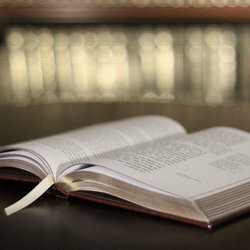 It is a fascinating enterprise, for here we not only touch the hem of Yeshua's garment through reading the gospel texts: we also touch the mind of a world-renowned scholar. In a sense, through the English translation of his Hebrew, Delitzsch discusses the New Testament text with us, with a stress upon its Jewishness. Quite exciting. It should be noted that the text comes very close to endorsing the perspective of the Jerusalem School of thought on the gospels which holds that Greek gospels are based on Hebrew originals. 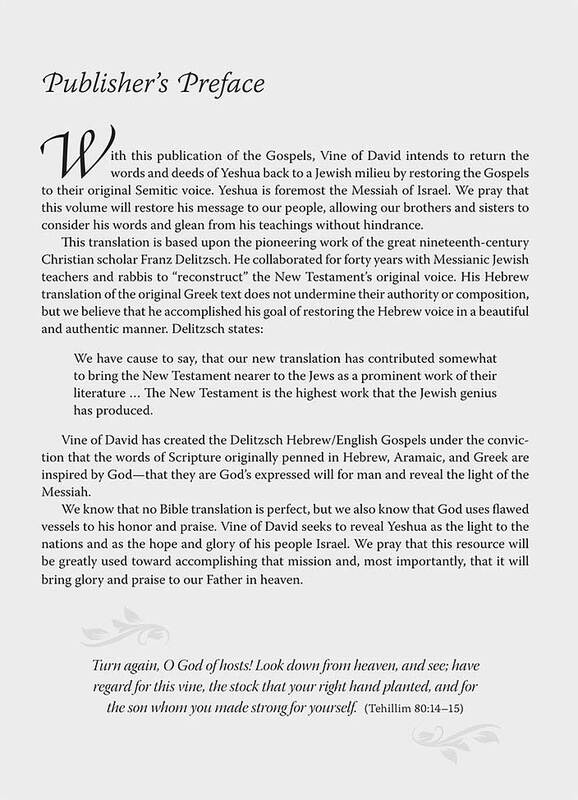 However, while coming close to endorsing this controversial view, the editors and translators of the DHE do not in fact endorse the view but instead stress the benefit of considering the Jewish thought forms likely behind the Greek text, holding that in the gospels, we have Jews thinking like Jews, even when they spoke or wrote in Greek. The scholarship of the DHE - The Translator's Preface alone is, for lovers of books, worth the price of the book. For both the neophyte layman and the interested scholarly reader it provides a fascinating summary of the influences, personalities, and decisions that helped shape Delitzsch's translation, making mention of scholarly Jews who believed in Yeshua, inhabitants of another time and place. The Translator, Aaron Eby, is also to be commended for being candid about the limitations of Delitzsch's work, especially in view of the discoveries of later scholarship. He demonstrates similar scholarly integrity in his comments on in a number of areas where the newer translation currently in vogue in Israel, gets things right where Delitzsch got them wrong. The Translators admit that the Delitzsch translation is not perfect, and even that it has some faults. Nevertheless, they strive to preserve it, even in the English translation, because it surely is fascinating! The scholarly touch is also evident in the Introduction to the Gospels as a whole provided in the book, and in the introductions provided for each gospel in turn. In all cases, homage is paid to rabbinic and Hebrew Christian scholars of the past, producing a document commendably free of the trendiness and superficiality which too often sells nowadays. Accessible scholarship is also evident in the lean marginal notes and footnotes provided throughout the text, enough light to illumine, but not to dazzle. Just the right touch. The beauty of the DHE - The book provides wide margins, clear text in a readable size, and plenty of white space per page making the book easier on the eyes. This is due in part to the layout decision to paragraph the text, double spacing between paragraphs and indenting quoted material. All of this creates visual air to breathe while reading the text. Apart from introductory materials and provided glossaries, maps and charts following the text, there are no illustrations in the book, although each chapter gospel introduction is decorated with a subdued and tasteful floral pattern. While not ostentatious in any manner, the layout and graphic elements accompanying the text are a delight to the eyes, making the text much more readable than it would otherwise be. The usefulness of the DHE - Anyone familiar with religious Jewish life knows there is something holy about a sefer. While the term means literally "a book," it is commonly used to denote a particular kind of book, a holy book. Such books are in all respects labors of love in their thought, their content, their layout, their binding, and their look. Happily, the DHE is a sefer, not the kind of book one will easily treat in a careless manner. It's thought, content, layout, binding, and look all contribute to making it so. For those of us who especially delight in the prospect of reading this text with other Jews, these factors are crucial. Any Jew opening this text, seeing Hebrew on one side, and English on the other will immediately be drawn into the ethos of Jewish holy discourse. The very look of the page brings us into Jewish space, and this is crucial to the usefulness of the DHE. Yeshua of Nazareth is widely regarded as alien to or even antagonistic to Jewish religious life and communal well-being. It is not enough that we who are Messianic believers and sympathetic Christians know this to be a falsehood: the true persona of Yeshua must be felt, displayed, and made known. Everything about this book, including its look and feel, in orthography, layout and production contributes to revealing Yeshua as Jewish and his world as being Jewish space. The DHE will do much to gain a hearing among my people for the One who said, "One who hears my words and believes the one who sent me has eternal life and does not come into judgment, for he has passed from death to life" (John 5:21, DHE). And this too is cause for rejoicing. We are in an era where serious scholarship has emerged to reclaim the words of Yeshua and the Gospel writings from a first century linguistic and cultural context. It is in this environment that Vine of David has broken into the field with a valuable addition through its Delitzsch, Hebrew Gospels, Hebrew/English translation. Vine of David has taken an old and respected source, the Delitzsch translation of the Greek Gospels into Hebrew, and has translated that into English, giving more people more access to this extremely significant work. But it has done much more by adding the gloss of a translator's preface, an introduction to the Gospels, appropriate Jewish prayers and blessings, footnotes, reference material, maps and charts and an index, all explaining and enhancing Delitzsch's work. But there is still more. One of the strong values of this work is the English translation itself, placing it squarely in the camp of those who characterize Yeshua as a Jew steeped in a cultural milieu consistent with a Jewish upbringing in the land of Israel during sectarian diversity. It is here that so many other translations pale in comparison to the Vine of David English translation, which makes it clear, true to Delitzsch's Hebrew translation, that Yeshua is thoroughly Jewish and everything he said must be examined through that understanding. Quite interesting, Vine of David is not shy about correcting Delitzsch's translation when the translator feels it is warranted due to best scholarship and contextual considerations. I am delighted that Vine of David has brought out this new edition of Franz Delitzsch's pioneering Hebrew translation of the Gospels. 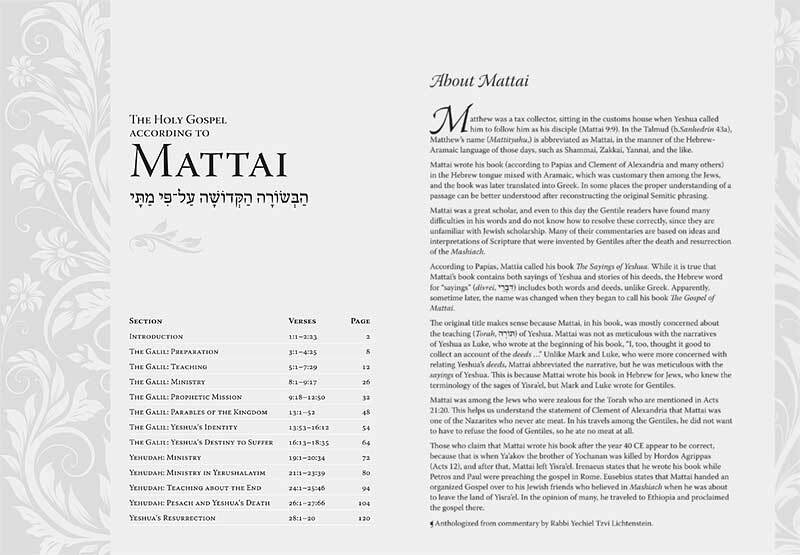 The text and translation, together with the accompanying notes, glossary, explanations of idioms and transliteration, represent an important milestone in Messianic Jewish scholarship, publishing and presentation of the Good News of the Messiah. Delitzsch's work combined deep sensitivity to the Jewish context of the New Testament, the linguistic qualities of koiné Greek and an authentic feel for the Hebrew language. His translation is not only academically respected but is also spiritually enriching and aesthetically pleasing. Although Delitzsch wrote more than a century ago, in the eyes of many, his translation is still unsurpassed, and this elegant new edition makes it accessible to a new generation of readers. Franz Delitzsch (1813-March 4, 1890) was a German Lutheran theologian born in Leipzig, Germany who grew into a unique man of God. Widely known and respected as a "Christian Hebraist," he was a pioneer in the area of Jewish studies in the New Testament and in the development of the Hebrew language. Delitzsch was a prolific writer, translator, and biblical commentator. 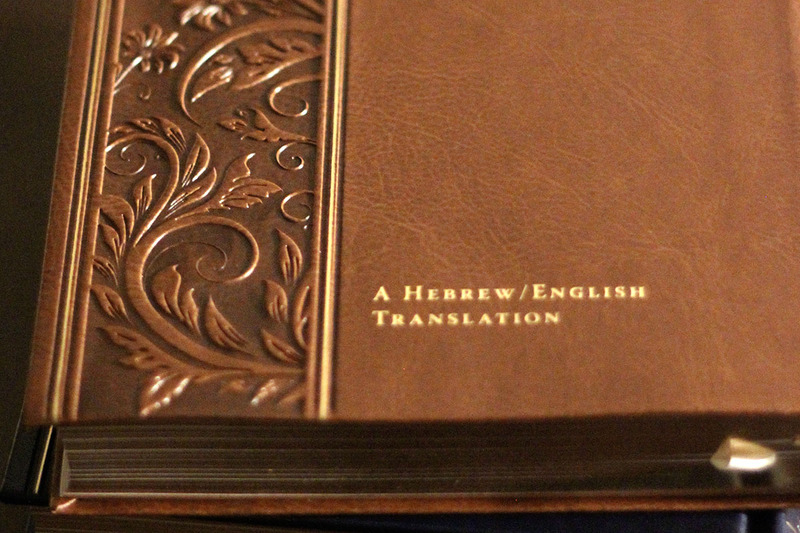 His greatest and most enduring work is his New Testament translation into Hebrew. At his eulogy, Delitzsch was memorialized with the following words: "Indeed, not only in the Christian, but also in the Jewish world the name of Delitzsch has shone. For he was at home in the literature of the Rabbis as none other among the living, and perhaps as none before him. We may say the truest friend of Israel is dead. A great man has fallen in Israel." Do you accept the authority of the Greek text(s)? Absolutely yes. Delitzsch’s Hebrew translation of the original Greek text does not undermine their authority or composition, but we believe that he accomplished his goal of restoring the original Hebrew voice in a beautiful and authentic manner. In fact, the Delitzsch translation uniquely presents various Greek sources giving the reader access to variants in the known accepted and authoritative Greek sources. So not only is the DHE a great resource to reading the Gospels in a Jewish context, but it reveals multiple textual traditions of the Greek text. There really is no such thing as an English Bible. There are only English interpretations of the Bible. In fact, every Bible is a "translation of a translation." Moreover, every translation is a commentary because in order to translate, one must first decide what the source text means, not just what it says. Deciding what something means is by definition interpretation and even the most literal, word-for-word translation must do this, even if only in the words the translator chooses. 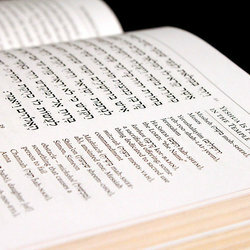 It is reported that the famed Dr. David Flusser, a devout Orthodox Jew and renowned New Testament scholar of Hebrew University, said that the Delitzsch Hebrew New Testament was the best translation of the New Testament extant in any language. Understanding all translations as commentaries is challenging for some to consider. However, if one accepts this view, it will be a great benefit to the student of the Bible. 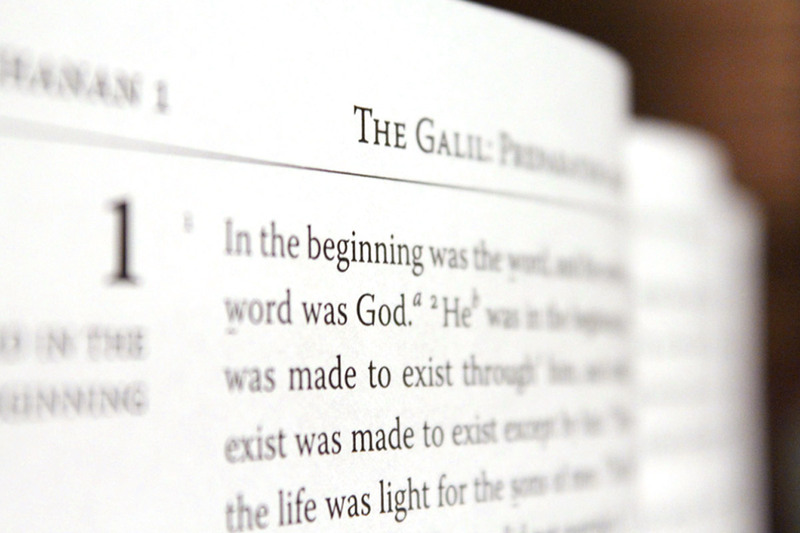 It was not our goal to produce the one and-only perfect English translation of the Gospels, as if that were possible. 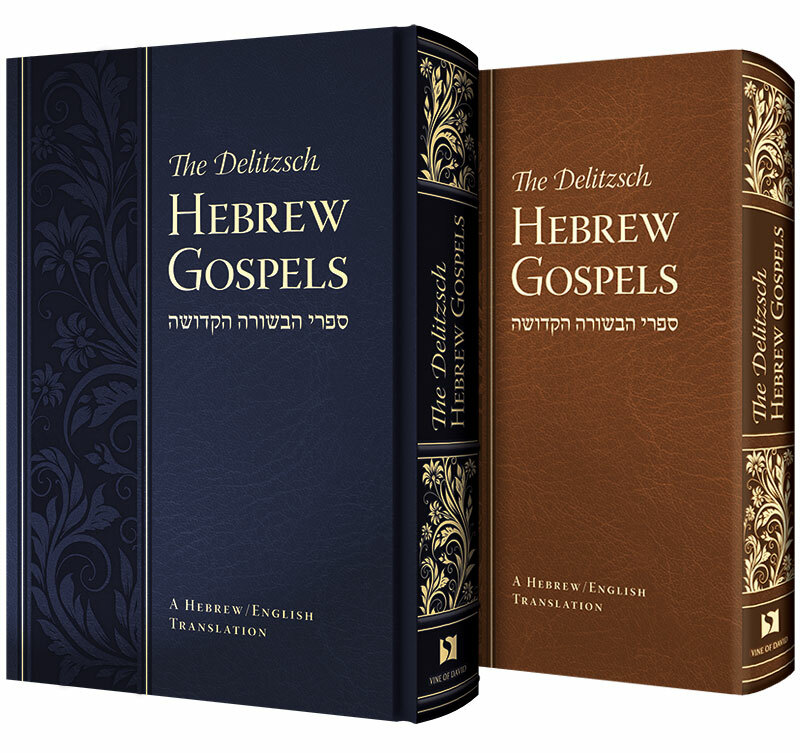 Rather, the English translation of the Delitzsch Hebrew offers readers another approach to the interpretation of the Gospels. Do I have to be able to read Hebrew to benefit from the DHE? No. The primary purpose of this English translation is to give readers easier access to Delitzsch’s work to help them understand the message of Yeshua. 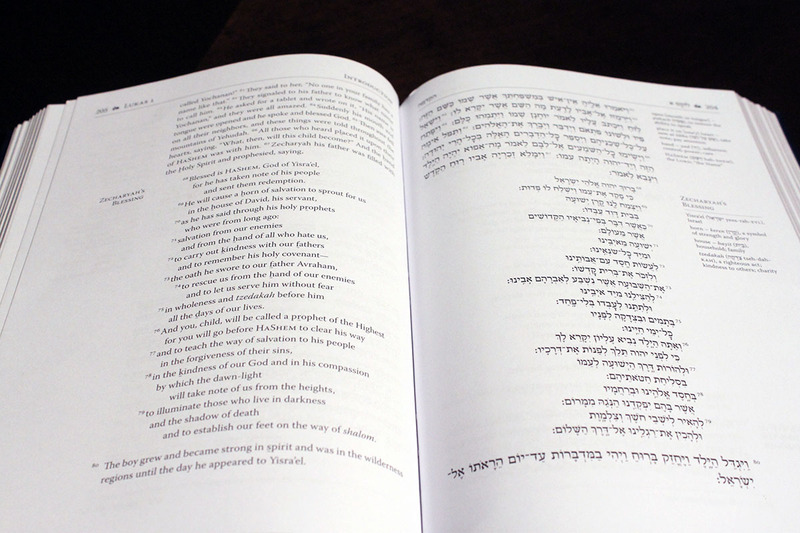 In fact, English readers will feel as if they are accessing Yeshua’s message (or even reading the Hebrew so-to-speak) through our various glossaries and transliterations. However, Hebrew readers of the DHE will exponentially benefit since it would be impossible to translate perfectly every idiom, inference, linguistic relationship, or nuance of the Hebrew text into English. Are you working on the entire New Testament? Not at this time. Committing to the translation and formal publication of the entire Delitzsch New Testament will require significant resources and prayer. Currently, we are prayerfully considering it and waiting for feedback on the DHE. 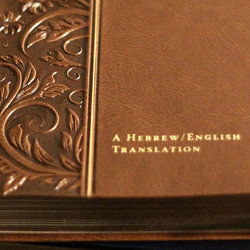 If the DHE is well received and a benefit to people, we will proceed if the following needs are met: 1) We would need to feel a spiritual confirmation to move forward with this major commitment of our staff resources; 2) We would need the financial resources to proceed; 3) We would need additional and more qualified Hebrew/Greek translators to work through the rest of the New Testament since our strength is in the Gospels. 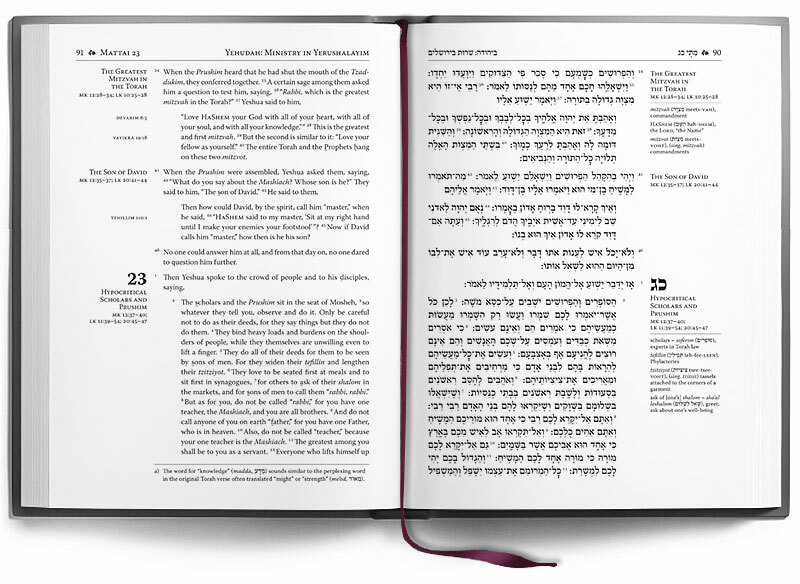 Do you have a commentary to accompany the Delitzsch Hebrew text? While the DHE and its various glossaries stand out on their own and are in and of themselves extensive commentaries, the more complete and comprehensive commentary can be found in Torah Club: Chronicles of the Messiah by First Fruits of Zion. 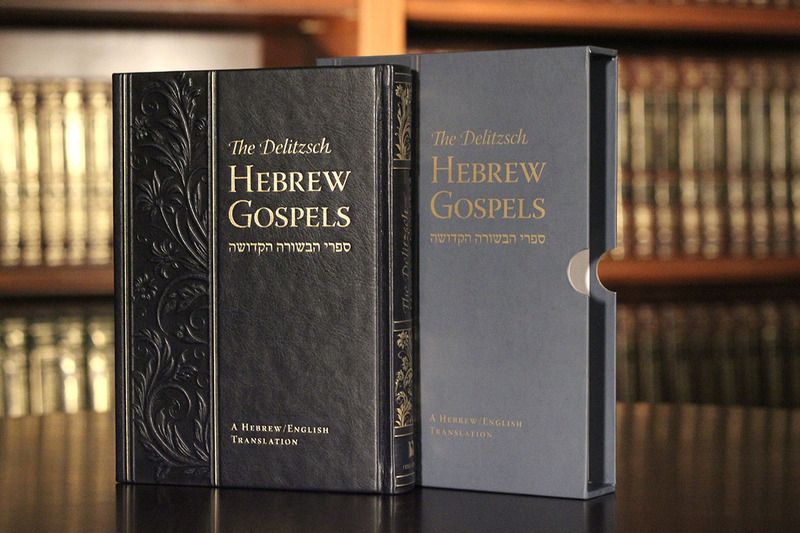 We created this commentary to expound on the Jewish background of the Gospels, on the Delitzsch translation and word use, and we have incorporated much of Rabbi Lichtenstein’s commentaries and reflections on the Gospels texts. 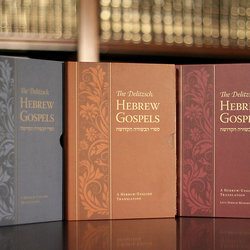 The commentary is extensive and is structured for a year-long study on the Gospels using a narrative style that chronologically works through the Gospels, pulling all of the synoptic sections together and giving the reader a comprehensive and systematic study of the life and teachings of Yeshua as revealed in the Gospels and related works. Wasn’t the spoken language of the Gospels Aramaic and not Hebrew? Delitzsch held the view that "the Hebrew remained, even after the exile, the language of Jewish literature." Citing numerous examples, he states, "The Shemitic woof of the New Testament Hellenism is Hebrew, not Aramaic. Our Lord and his apostles thought and spoke for the most part in Hebrew." So Delitzsch’s work, on some level, attempts to reconstruct the actual teachings of Yeshua in Hebrew. Delitzsch produced his translation according to how he felt it would have been worded if it were originally thought and written in Hebrew. Once the Dead Sea Scrolls came to light in the mid-twentieth century, much of modern biblical scholarship began to consider that the original voice (language) of the Gospels would have been Hebrew rather than Aramaic. What were Delitzsch’s Greek sources? Delitzsch based his first edition on the Codex Sinaiticus, which is to this day considered one of the oldest and most reliable manuscripts of the Greek New Testament. However, at the behest of the British and Foreign Bible Society, subsequent editions followed the Textus Receptus, a more traditional and less critical edition. The eleventh edition of Delitzsch’s translation, which appears in the DHE, was finally revised to reflect a better, more critical text based on older manuscripts. He placed important variants found in the Textus Receptus in brackets and footnotes. Is the DHE’s citation of rabbinic sources anachronistic? Yes. Anachronism is an inconsistency in chronological arrangement of events, persons, customs, or theological frameworks. 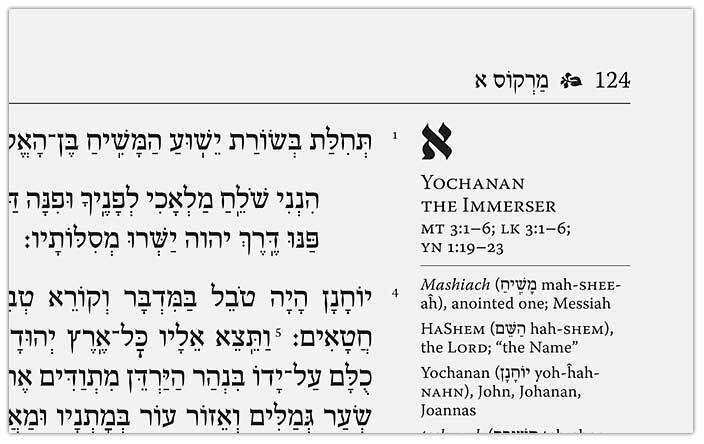 In its introductions and glossaries, the DHE compares the words of Yeshua with rabbinic literature from later centuries. The DHE assumes that the Gospels were birthed out of first-century Judaism and that much of the idiomatic language of the Gospels contained therein can be better understood when compared with later Jewish literature. Although rabbinic sources were often committed to writing centuries after the Gospels, they nevertheless retain customs, concepts, culture, and language pertinent to the study of Second Temple Judaism on the strength of oral tradition and the Jewish community’s unique resistance to acculturation and assimilation. 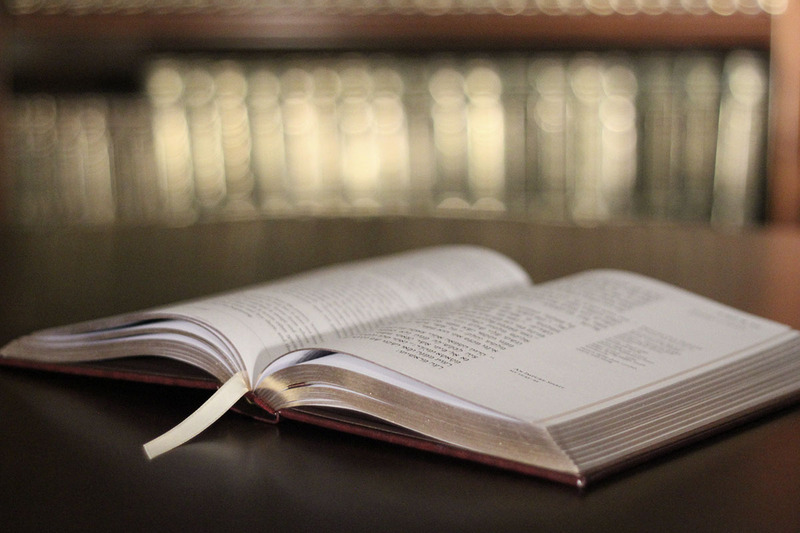 Relying on the later rabbinic texts to explain terminology and concepts in the Gospels is anachronistic, but this method is problematic only if the later rabbinic texts are presented as historically authoritative, which the DHE does not do. 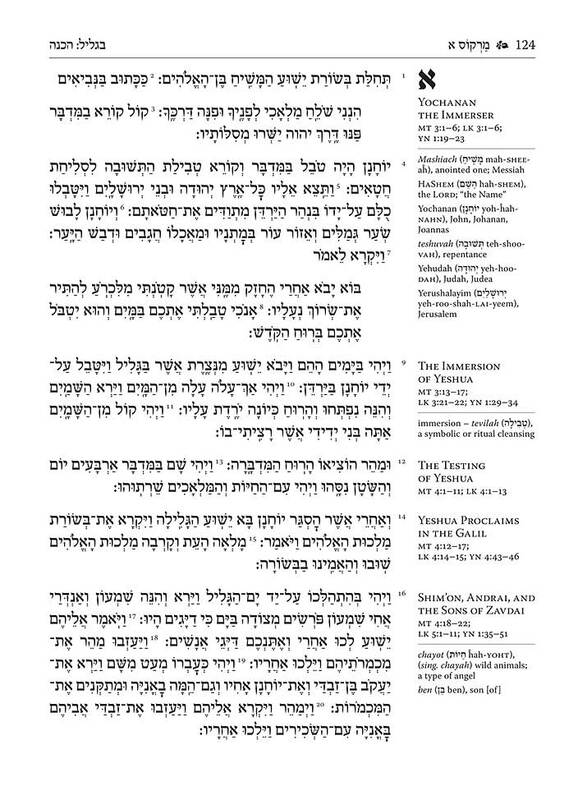 Did you edit or change the original Delitzsch Hebrew text? Our publication follows the eleventh edition of Delitzsch's New Testament, published in 1892. This edition, carried out by Gustav Dalman, contains Delitzsch's final corrections before his death. We did not modify a single letter of that text, but we did make the a few cosmetic changes to make the text easier to read. We inserted paragraph breaks to divide the text into smaller portions and also added indentations for long quotations. We inserted the meteg (a small vertical line that indicates the accented syllable) to any words whose accent does not fall on the final syllable. We also enhanced the text by using an enlarged kamatz katan (also known as chatef kamatz) to aid readers who pronounce this vowel differently from a kamatz gadol. However, it should be noted that many other editions of Delitzsch's New Testament exist. Not only are there the ten revisions published during Delitzsch's lifetime, but numerous other publishers have taken liberties with his work. This may account for any differences you find between the Vine of David Delitzsch Hebrew/English Gospels and other publications.